It’s an amazing product since the large blooms will cover a big area, so you get so much bang for the buck. Add the stunning colors, year-round availability, and advantageous pricing, and you have an absolute winner. Hydrangeas are very rewarding; they offer lots of show and last for a long time if cared for properly. 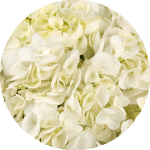 Hydrangeas are often shipped with a little bag of water or gel at the end of the stem. Cut the stem at a diagonal right above the bag and immediately place the stem in a clean vase or bucket filled with lukewarm or room temperature water (approx 6” high). In the event product arrives slightly dehydrated due to shipping you may put them in a bath of water, make sure this water is at room temperature, let them float for a couple of hours and rearrange. As with most other cut flowers re-cut stems at an angle, remove most of the foliage leave enough foliage to maintain your preferred look and place in at least 6” of water or more. For maximum performance, please keep away from direct sunlight and drafts, such as heating vents. NOTE: Hydrangeas drink a LOT of water so be sure to check your water levels often!